From a typescript in the L. Bradford Prince Collection, New Mexico State Records Center and Archives, Santa Fe, as cited in the appendix of Turquoise and Six-Guns, The Story of Cerrillos, New Mexico by Marc Simmons, 1974, Sunstone Press. Proceedings of a Miners' meeting, held at the mining camp of Dimick and Hart, situated in the South-east corner of Section 32, Township 15N, Range 8E in Santa Fe County, Territory of New Mexico, March 27, 1879, for the purpose of defining the limits of a Mining District, also to establish rules and regulations for the governing, the location of mining claims and the working of the same, within said district. On motion Frank Dimick was appointed Chairman and Robert Hart, Secretary, of the meeting, and the following rules were adopted. 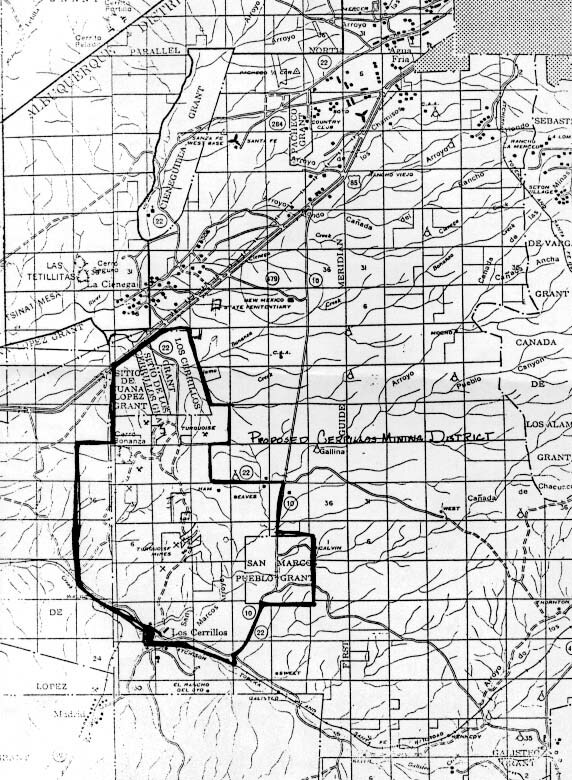 Resolved: That this district, organized under the authority of the laws of Congress and of the Territory of New Mexico, shall be called the mining district of the Cerrillos, and said District shall embrace townships 14 and 15 north of the base line, range 7,8,9 of the N.M. principal meridian. 1st. All claims located prior to this date, having been located under the U.S. mining laws, cannot be reduced in extent, but all lodes hereafter located will be limited to 150 feet on each side of the vein, and 1500 feet along the course thereof. 2nd. Each person, who is the owner of an interest in a mining claim shall be entitled to vote in the election of a Recorder chosen at this meeting to serve until his successor is elected and qualified for which a meeting will be held, annually on the first Monday in September. 3rd. The Recorder shall faithfully record all claim notices and deeds of transfer in books kept for that purpose, and shall be entitled to charge and receive the amount of two dollars for each entry, for which he will return a receipt to the party making the application. 4th. It shall be the duty of the Recorder to furnish, on the application of any party interested, a certified copy of the records at the same rate. 5th. On the application of five persons interested in these mines, it shall be the duty of the Recorder to call a meeting by posting in four conspicuous places within the District, Notices specifying the object of the meeting, at least 15 days prior to the time stated in said Notices. 6th. In all location of claims, a notice shall be posted thereon with name or names of the locators and the date thereof, at or near the discovery shaft; the same to specify the number of feet claimed in each direction from the notice along the lode; the corners of the claims to be marked by stakes or monuments. 7th. In claims hereafter located, a shaft no less than ten feet deep shall be sunk on the vein or lode, within 90 days from the date of location. 8th. All notices of the taking of claims shall be recorded in this District, within 90 days from the date thereof. All claims located under the US. mining laws will be subjected to the above conditions from this date. 9th. In estimating the value of improvements, recognized under the U.S. mining laws, viz: One hundred dollars per annum on each mining claim, labor shall be estimated at four dollars per day. On motion Frank Dimick was unanimously elected Recorder. These rules and regulations will remain in force until altered or amended by the decision of a regular miners' meeting. 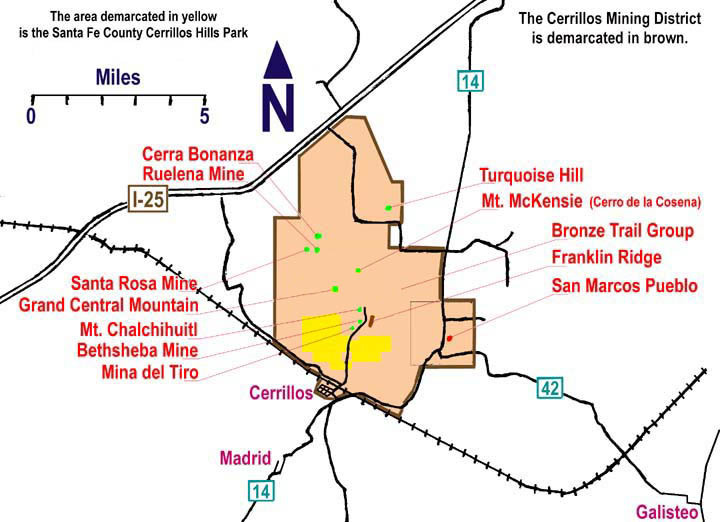 The original designation of the Cerrillos Mining District in the 1880s was done solely for the convenience of miners to locate boundaries and sort out small claims, and the District was defunct near the turn of the century (1889). The eventual placement of the Cerrillos Mining District on the register of Cultural Properties in 1973 occurred because of its vital importance as one of the most historic districts of its kind in the entire state. It is not considered a mining zone and has no legal status as such, since the area's zoning has always been agricultural and/or residential. There has also been a tremendous change of character in the area since those old pickax mining days. The shift from what was once a pickax mining district to a larger surrounding residential area with a tourist-based economy has been recognized and underscored by Santa Fe County's acquisition of the Cerrillos Hills Historic Park and the expected purchase of neighboring Mount Chalchihuitl.